Bellafill® is a unique injectable collagen filler with micro spheres that can instantly smooth facial wrinkles (nasolabial folds) for beautiful, natural-looking correction that lasts. Bellafill consists of tiny microspheres blended with a small amount of collagen and a trace dose of anesthetic to relieve mild tenderness after treatment. 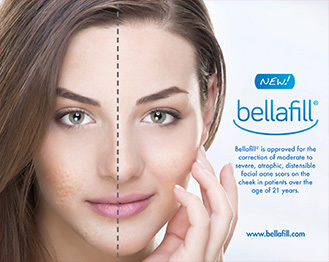 When Bellafill is injected under a crease, the microspheres fill in the depression, raising the skin to its normal height. After 3 months, the injected collagen dissolves, and is replaced by your body’s own collagen which binds the microspheres in place. Because of this “anchoring” effect, Bellafill® can maintain its results for up to 5 years. Bellafill® can be used to correct facial folds and wrinkles, acne scars, vertical and horizontal frown lines, depressed corners of the mouth and can create fuller lips. Treatments of Bellafil should also be done with intervals inbetween of at least 6 to 8 weeks . This will allow time for the collagen carrier to dissolve and the microspheres to be properly implanted. A series of 2-4 treatments are needed. In addition to immediately adding volume to the skin to lift wrinkles known as smile lines, Bellafill® re-creates the firm structure of younger-looking skin by supporting production of your body’s own collagen. It is a Health Canada approved dermal filler. Are you suffering from acne scarring? Bellafill® adds volume below the scar to lift it to the level of surrounding skin for the smoother skin you’ve dreamed of. The PMMA (polymethylmethacrylate) re creates the firm structure of smoother looking skin by supporting production of your body’s own collagen—for lasting results. A: Bellafill® is a dermal filler made with collagen gel and PMMA microspheres. Bellafill® re-creates the firm structure of younger-looking skin by supporting production of your body’s own collagen. A: The microspheres are made of polymethylmethacrylate (PMMA), one of the most widely used materials in medicine for 65 years. The tiny microspheres in Bellafill® are half the diameter of a human hair, so small that they are virtually invisible to the eye. A: The collagen gel in Bellafill® provides immediate volume and lift. Over time, the collagen is absorbed by the body. The PMMA microspheres remain in place and create a matrix that supports production of the body’s own collagen for lasting correction. A: Granulomas are inflammatory reactions that can occur with all fillers and may be treated. Bellafill® was studied in the longest and largest filler safety study ever conducted. The granuloma rate was 1.7% and majority had resolved or improved with treatment by the end of the study. A: Bellafill® provides a microscopic ‘matrix’ to support your body’s own natural collagen production, and ultimately strengthen the layers of the skin. This provides the support your skin needs for wrinkle correction and younger-looking skin, with results that last. In clinical trials, Bellafill® showed significant improvement in smile lines at 3 months and 6 months after treatment, and continued to show improvement at 12 months. Patients showing a positive response to the required Bellafill Skin Test. Patients with severe allergies (for example, a history of severe hypersensitivity [anaphylaxis] or a history or presence of multiple severe allergies). Patients allergic to lidocaine or cow tissue products, including but not limited to, Injectable and implantable collagen, collagen sponges, and collagen-based sutures. These patients are likely to be hypersensitive to Bellafill. Patients undergoing or planning to undergo injections to reduce allergies to meat products. Patients undergoing or planning to undergo lip enlargement (augmentation) and injection into the red pigment (vermilion) or the wet mucus membrane (mucosa) of the lip.